The Duck’s Bill was introduced by Fred Streeter, Head Gardner at Petworth House in 1937. It is currently cultivated as part of Brighton Permaculture Trust’s National Collection in Stanmer Park, Brighton. You can see a Duck’s Bill apple tree (planted 2009) in Home Farm Orchard, Stanmer Park ( map). The apple is distinctively ribbed and flat sided, which gives it its name. Tall conic with prominent ribs on the body and at apex. The skin is yellow, streaked pink with a red flush. There are russet dots. 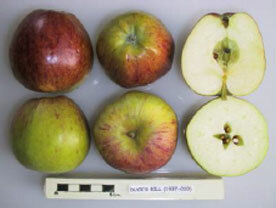 There are other apples such as Winter Pearmain which have a similar appearance. Quite rich tasting, sweet, but with plenty of acidity. The apples can be picked in early October and stored until December. The tree is medium vigour and very upright.